Kumble Subbaswamy says he has a comfort level with the flagship campus of a large state university system. Indeed, his last few stops have included the University of Indiana’s main site in Bloomington, where he served as dean of the School of Arts and Sciences and also as a physics professor, and at the University of Kentucky’s Lexington campus, where he currently serves as provost, and held a number of positions earlier in his career. 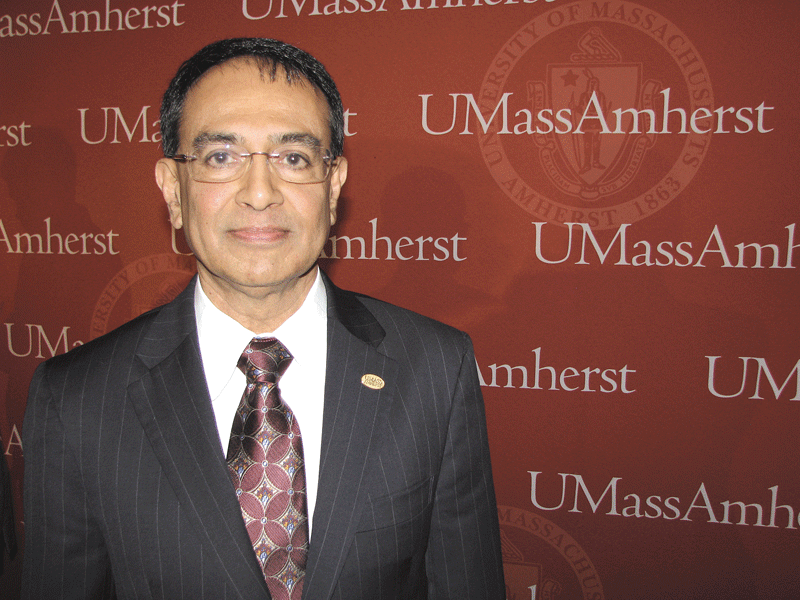 “The role of the flagship campus is something I passionately believe in,” said Subbaswamy, or “Swamy,” as he’s known to friends and colleagues, at a press conference concerning what will soon be his biggest career challenge to date, the role of chancellor at another flagship campus — the Amherst facility of the University of Massachusetts. He would go on to tell a large assemblage of local media that he considers it his primary assignment in that post to help make sure the school honors all the many responsibilities that go with that designation ‘flagship.’ And these include strong relationships — and partnerships — with a host of constituencies, including other campuses within the UMass system, the state’s many private colleges and universities, the neighboring Amherst area, and the larger Greater Springfield region, especially in the broad realm of economic development. Subbaswamy, who was named chancellor in late March, will succeed Robert Holub, who, during his four-year stint, earned praise for his work to help revitalize downtown Springfield (he earned BusinessWest’s Difference Makers award largely for those efforts), and took the Amherst campus to new heights in terms of research awards ($170 million) and in fund-raising ($57 million). However, his tenure was rocked by turmoil — especially in the form of an aborted attempt to locate a medical school in Springfield — and he was essentially forced out. At the elaborate press conference staged on the 11th floor of the Campus Center Hotel on April 2, Subbaswamy said he intends to build on the momentum generated by Holub — especially with an initiative the outgoing chancellor called the “Framework for Excellence.” That document, drafted in 2009, contains a number of stated goals — from increasing the size of the faculty to doubling the number of federal research awards; from boosting the number of graduate degrees awarded to increasing diversity on the campus. Appearing at his press conference with UMass President Robert Caret, Subbaswamy touched on subjects ranging from the many challenges facing public higher education, especially in the Bay State, to the recent decision to take the UMass football program to the bowl subdivision; from those partnerships he mentioned to strategies for making the school more affordable, and therefore accessible. For this issue, BusinessWest recaps Subbaswamy’s thoughts as he reflected on the challenges and opportunities that lie ahead. When asked by BusinessWest to describe the management style he will bring to the Amherst campus and the bureaucracy-laden world of public higher education, Subbaswamy summed it up with two words — transparency and communication. “The more people know the facts, the more people who know how you arrived at decisions, the better,” he explained. “They may not like the answer, they may not like the final decision, but the process itself is very important, and transparency is very important. Subbaswamy has honed this approach during a 30-year career in higher education, most of it spent at public universities. He started in Lexington as an associate professor of Physics, and eventually held titles that included associate dean of the College of Arts & Sciences and chair of the Department of Physics & Astronomy. He moved on to the position of dean of the School of Arts & Sciences at the University of Miami in Coral Gables, Fla., a post he held for three years before taking the same position at the University’s of Indiana’s Bloomington campus in 2000. He became provost at the University of Kentucky six years later, and also served as director of the University of Kentucky Research Foundation starting in 2007. He said he was drawn to the UMass Amherst position because of the school’s strong record for academic excellence, as well as an opportunity to put that aforementioned comfort level with flagship campuses to the test in a new career challenge. “It was a good match for my skills, my passion, and what the institution was looking for,” he said of the chancellor’s post. Elaborating, he said that mission, although it has certainly evolved from the time, a century and a half ago, when agriculture played a much bigger role in society and the economy, is relevant and multi-faceted. It involves both the many educational components of a state university, he went on, and the inherent responsibilities in the area of economic development. The chancellor-elect acknowledged that he will soon be working in a state known worldwide for its many private colleges and universities, and where public higher education has historically been funded at lower levels than in most other states. He said these facts present both challenges and opportunities, and that one of his main goals is to help elected leaders, alumni, and other constituencies understand the importance and value (a word he used often) of the state university, while at the same time collaborating with those private schools. “I will constantly be remembering and reminding the University of Massachusetts Amherst campus that it’s really the flagship of the entire Commonwealth,” he continued, “and therefore, we need to really have our influence felt across the Commonwealth. Meanwhile, Subbaswamy noted that access remains an issue at UMass and many other public colleges, with rising costs being the primary issue of concern. With that in mind, he said one of his priorities will be to closely examine the expense side of the ledger at the Amherst campus, with the ultimate goal of improving efficiency and making the most of available resources. 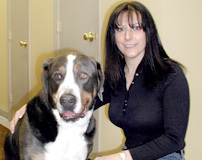 “We all need to re-examine how we do business,” he explained, emphasizing that word all. “It will start at the top in terms of looking at the administrative structure and administrative expenses, in order to have the credibility to challenge the entire institution to look at all aspects, both academic and business; it has to start at the very top. But it’s not the only answer to the problem, he went on, noting that the state’s investment in higher education must continue and improve, if possible. If not, fewer people will have access to higher education and the opportunities it provides to thrive in today’s innovation-driven economy. As for the university’s decision to move its football program to a higher level, Subbaswamy, still provost at the school that just won the NCAA men’s basketball title, said he fully supports that move, and contends that big-time athletic programs can help raise a school’s profile and help boost enrollment and fund-raising efforts. That is, if it’s all done right. 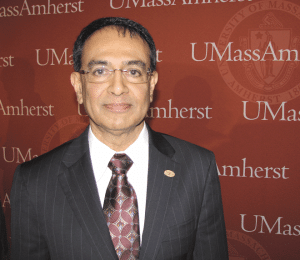 Subbaswamy said he knew a good deal about UMass before becoming a candidate for the chancellor’s position, and he’s learned a good deal more since. Like some of his predecessors who have come from other parts of the country, he said the school appears to enjoy a better reputation — and earn more respect — outside the Commonwealth than within it. He told the assembled press that one of the many items on his to-do list is continuation of the work to change that equation. He knows there are challenges, but, overall, he’s optimistic. And with good reason — he has a comfort level with the stage he’ll be working from.